Looking back at all we did in 2015, we are full of gratitud. Many thanks to all of our sponsors, donors, magicians, friends and every-other person we shared something in this wonderful year. Here we want to give you a little summary of what we lived in the past year. As a very short summary, in our El Salvador Project, we want to highlight the work of Maricela and Peter, two magicians that after going through our program, graduated from culinary school and now are training a second generation of magicians in El Salvador so that they can have the same experience Maricela and Peter had. All this was possible because of our local partners Glasswing in El Salvador, and all the work Ryan Bart put in to make this possible. Our Colombian project is blossoming into a new kind of social venture. The kids of the magic school received a 24 hour entrepreneurship and personal finance course with the help of one of Colombia’s most elite administration universities: CESA. As a result the kids structured their own company called: “Por Arte de Magia” and have since sold 4 corporate events for some major corporations and are doing magic at Wingz (a local chain restaurant) in a monthly basis. All of this is paid work, which helps the kids earn extra money that is much needed to help at home. The kids got invited to do a performance act in TEDxCESA, you can watch the video here which has a comment by one of our donors of magic kits; The master magician himself: Lance Burton. We have traveled to India, most recently to Maher, were we continue to spread hope though magic performances and teachings in the form of conventional clases and big camps combining other arts like mime and theater. In this year we had the opportunity to reach out to more people and to let them know about our work, two of the main spaces we did such a thing was. First in Do Lectures Costa Rica, where Carlos López did a presentation about the work in the Colombian project. Second in TEDxFulbright where Ryan did a presentation about his journey that has taken him to all of our education projects all over the world; Colombia, El Salvador and India, see his inspiring talk here. It has been a wonderful year! 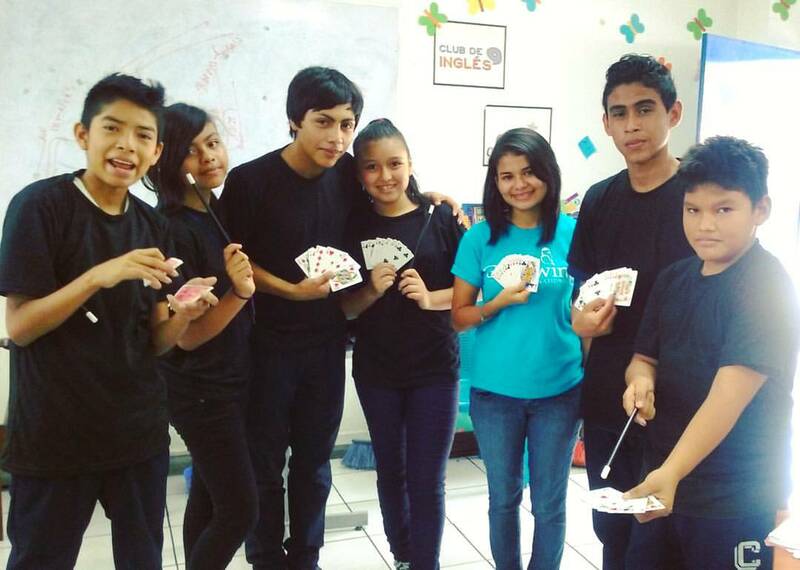 We have Educated, Entertained and Empowered all over the world through magic! We will continue to do so and we hope we continue with your support. We wish you a magical 2016 filled with prosperity, abundance, love, magic, awe, inspiration and happiness. This entry was posted in Colombia, El Salvador, Featured News, Magic in India, Media, Our Travels. Bookmark the permalink.